another one that I have always wanted to test to see if it is as good because the picture of the cake that accompanied the recipe looks so temptingly good. The recipe is from Red Book magazine that I clipped a couple of years ago. So when a friend shared with me some of her fresh apples from her tree a week ago, I knew what I was going to do with them....try that recipe. Here's the recipe that I adapted from Red Book magazine. I don't know why, but I ended up slightly tweaking the recipe (indicated by red asterisk). 1) heat oven to 350 degrees. Spray a 10-inch removable bottom tube pan with cooking spray. Sprinkle nuts evenly on bottom of pan. 2) In a bowl, mix 2 TB flour, brown sugar, cinnamon and cloves. Add apples and toss to combine. 3) In another bowl, mix all purpose flour, baking powder and salt. Set aside. 4) In large bowl, cream together white sugar, oil and butter. Beat in the eggs one at a time. Stir in the orange juice, vanilla then the flour mixture. Beat until the batter is smooth. Fold in the raisins. 5) Pour half of the batter into prepared pan. Arrange half of the apple mixture on top of batter. Spoon remaining batter over the apples and top with the remaining apples. 6) Bake 1 hour and 20 minutes or until a tooth pick inserted in center of the cake comes out clean. Let cake cool in the pan on a wire rack for 3 minutes. Run a knife around the sides of cake and turn the cake out onto a wire rack. Invert cake onto another rack to cool. 7) Drizzle caramel sauce on the entire cake or on each slice. Let cake cool on a wire rack for about 30 minutes before slicing. The finished product is very similar to the other recipe from Cooking Light magazine. The main difference is the cream cheese and the method of preparation. Hope you give this recipe or the other one a try...they are both good!! A friend on facebook requested that I post the link for the original recipe. What I have is the recipe I clipped from the Red Book magazine, but I googled it anyway to see if they have it on their site. So here's the recipe found on their website, click here. It is exactly the same recipe as it appeared in their magazine. I made this Apple Cake today in a 9"x13" but replaced the orange juice with 1/2 cup of plain yogurt because I ran out of orange juice, then I mixed everything together like the procedure in making banana bread, combining wet and dry ingredients together. It only took 45 minutes to bake it. It is very easy to prepare and it turned out real good, in fact it is better than the original recipe and I think this is my favorite. Next time I will make some muffins with this recipe. every single one of them raved about how good they are. So I made a batch for a party. These are muffins that supposed to taste like doughnuts. because there was no trace of doughnuts in them. it's just that I was looking for the doughnuts in the muffins. instead of the regular ones. which was great for the crowd we had. the donuts in them the second time. who is a half Mexican and half Spanish (as in Spanish from Spain). this dish has a real Spanish influence. This is another dish that I make without measuring the ingredients. So the ingredients above are just for your guideline. Saute garlic, onions and tomatoes in canola oil. Add in the chicken and saute really well until they render their own fat. Season with salt. Stir in the squash, tomato sauce and the jalapeno pepper. Put lid on and simmer for about 15 minutes then add water or broth; continue to simmer until the chicken is tender. I like to mash some of the squash during the process as it makes the sauce a little thick. Add some more liquid (broth or water) when necessary, otherwise, its done!! My daughter-in-law usually makes this dish with just chicken breasts, but I prefer dark meat over the breasts so I make this with cut up whole chicken then I just use the dark meat and freeze the breasts. 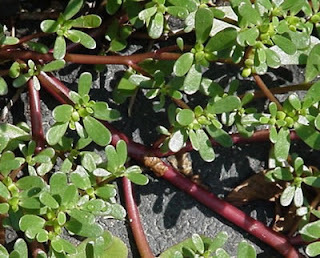 Do you have these kind of weeds in your yard along with those annoying dandelions? These are called Purslane and you'll be amazed when you find out how nutritious they are. This was brought to my attention by a cyber friend in the Philippines who said that her neighbor's pigs are getting fat and healthy from eating this weed. She made me so curious so I googled and found out that they are a culinary delight...yes, they are edible and full of nutrients, according to the infos I just found. Please click on these links here from google. They have some valuable information on this plant and some interesting recipes. Am I ready to try them though? I don't know!! will let you know when I am. This is what I call an emergency cake as you can make this in just a few minutes...all you need are the ingredients below, a mug, measuring spoons, a spoon for stirring and a microwave. So when you get up in the middle of the night and have a craving for a warm chocolate cake, just stir all the ingredients in a mug and microwave it for 1-1/2 to 2-1/2 minutes and voila!! a cake like magic!! I combined 1/2 cup of semi-sweet chocolate chips morsels in 3 tablespoons of milk. Scalded in the microwave just to melt the chocolate pieces, about 45 seconds. I wanted to make a Rocky Road cake, so I threw in some mallows and nuts (those are pistachio nuts) then I used a little bowl to mix everything together. (Mix everything right in the mug if you want). Poured the mixture in the mug. I don't know how many ounces this mug is but it holds 2 cups of liquid. After microwaving it for 1-1/2 minutes, look what a big mess it made!! Cake is done, but sure is messy and so unappetizing. so you can go back to bed and do the clean up in the morning. not bad for a microwaved cake, huh? but for "emergency" this isn't bad at all. Melt chocolate chips with the milk in the microwave for about 45 seconds, then mix in the rest of the ingredients in a bowl. Spray a mug with a cooking spray then pour in the mixture. Microwave on high for 1 minute to 2 minutes depending on the wattage of your microwave. 1) if baked in the microwave longer than 2 minutes, the cake will be somewhat dry. 3) for an added flavor, add about 3 TB of peanut butter.